Thank you to everyone who was able to attend LUG ‘14! A special thanks to all of our sponsors, especially Gold sponsors Cray, DDN, Intel, System Fabric Works, Warp Mechanics, and Xyratex. All the support, advice, and pats on the back were really appreciated. The annual LUGs are truly a community effort. 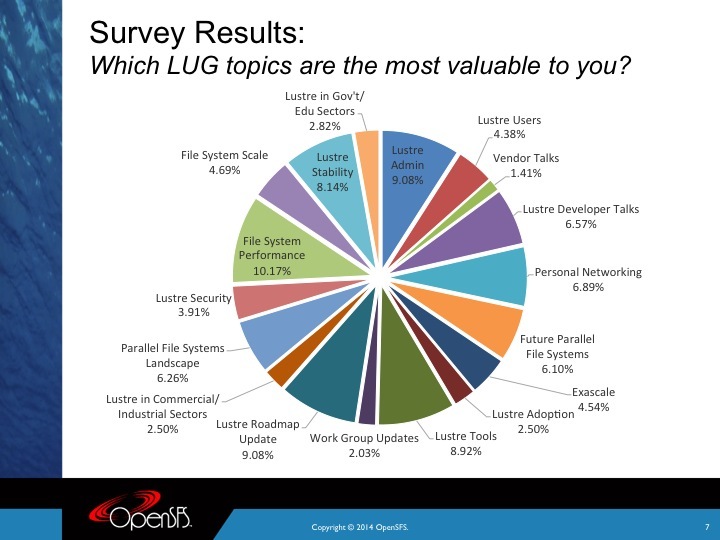 We tracked quite a bit of information leading up to and during LUG and wanted to share some of that here, especially a breakdown of our LUG ’14 survey results. In general, we were extremely pleased at the range of responses and the overall very favorable results. LUG 2014 had 196 attendees, making it our highest attended LUG to date. There were 127 OpenSFS members from 19 different companies. There were 39 speakers. We were also interested in who was attending and what topics they were most interested in. 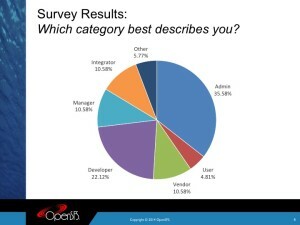 Self-descriptions of attendees shows that Admins and Users account for over 40% with Developers at about 22%. Clearly this is an event that focuses on people who really use and understand Lustre. 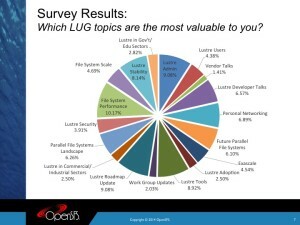 Which LUG topics are the most valuable had such a wide spread that it’s hard to come to an immediate conclusion of a main focus. Admin issues like stability, performance, security, tools and more are big. So were topics that point to where Lustre is going like the Lustre Roadmap Update and Future Parallel File Systems. LUG attendees have a wide range of interests! The entire event was productive and engaging, and we couldn’t have done it without you. Seeing the range of attendees and sponsors continues our excitement about the future of Lustre. We look forward to seeing you at a coming Lustre event soon – and online!